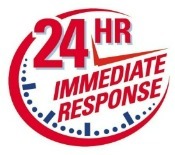 ABC located in Canton, Ohio offers "24 Hour Repair Service" 7 days a week. We are always here to help. From power outages and technical faults to natural disasters such as a flood or storm, when your system is down, we will get you working again fast. We understand that you need a reliable local company with an outstanding response time, to service your communication equipment. Hiring local has its advantages. Our friendly, professional technicians service most major brands of telephone and paging equipment. When you need quality, affordable, fast service, call Always Better Communications, Inc.